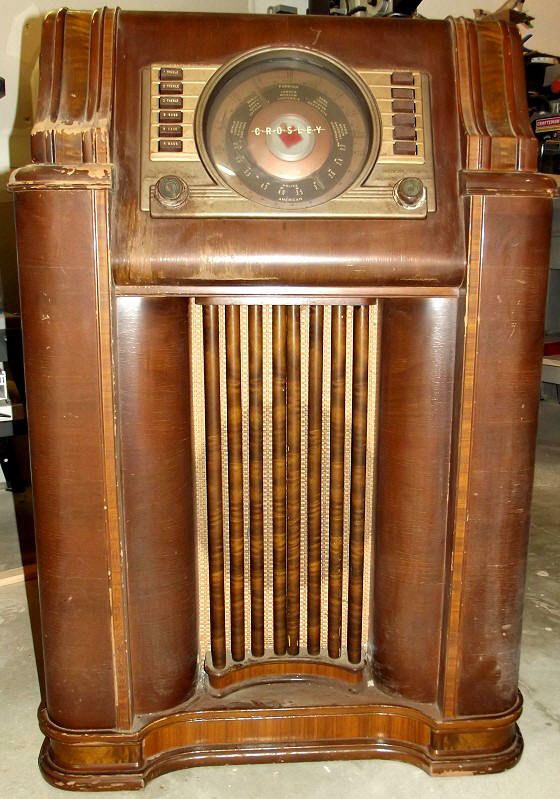 Now that my nearly 4-year-long grandmother clock project is finally finished, I'm on to the next big project, which is to restore a 1941 Crosley 03CB console radio. My intention is to do as complete a restoration as possible (or reasonable), including repairing and refinishing the wooden cabinet, stripping and repainting the metal faceplate parts, and completely disassembling and rebuilding the electronics chassis. By disassembling and rebuilding the electronic chassis I mean unsoldering and/or unbolting/unriveting every component and then testing and reinstalling every part. Fortunately, shortly after buying the Crosley radio ($75) from someone who advertised it on Craigslist, a complete electronics chassis appeared on eBay for $20, so I bought it. Now I have two of everything from which to make a good working model. 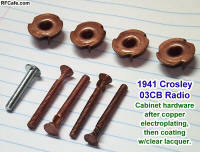 Some items like the old paper capacitors will need to be replaced with modern versions. The vacuum tubes have not yet been tested. While removing some of the hardware that mounts the electrical chassis to the wooden cabinet, I discovered some of it was copper plated. So were the 10-32 threaded studs that held the speaker to the frame. At first I figured I would either just remove what plating remained with a wire wheel on the grinder, or maybe paint it a copper color. Then, I said to myself, "Self, why not try re-plating the copper?" After all, I took a couple chemistry courses in college and remembered electroplating a nickel with copper from a penny. 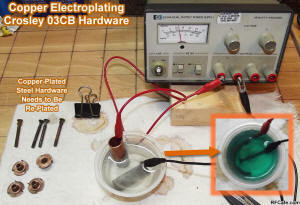 So, I looked up how to do copper electroplating on the Internet (a resource not available when I restored my first Crosley 03CB radio back in the 1980s). The preferred method seems to be using a solution of copper sulfate with a small voltage potential applied between a copper bar anode (+) and the work piece cathode (-). Electroless plating could be done with a special commercial solution, but I didn't want to pay the price (about $40) just to plate some hardware nobody but me would ever notice. Since I didn't have any copper sulfate on hand I decided the third method would get tried first. That involved creating my own dissolved copper solution by using copper bars for both the anode and the cathode in an acid bath, with an applied voltage to facilitate a speedy result. As can be seen in the photo to the left (above), copper did dissolve handily into the solution after about half an hour at a current of about 100 mA (not a scientifically determined number - it just seemed right). 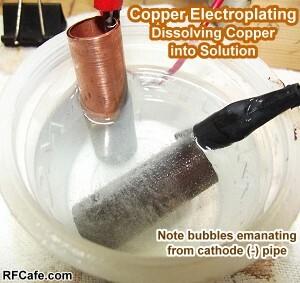 You can see the bubbles coming off the cathode copper pipe in the photo to the right. White vinegar was used for the acid. It started out clear and then turned a characteristic blue-green over time. I was quite pleased with the result, but the pleasure was short lived. I removed the copper pipe from the negative lead and clipped it onto on of the 10-32 threaded studs and submersed it in the solution. After about 10 minutes with a current again at 100 mA the stud exhibited some good copper-colored plating, but it wiped off with a rag - bummer. I spent a couple hours testing other current levels but nothing produced a good robust plating even though all visible oxidation had been removed from the studs and they were wiped with acetone prior to dipping. Back to the drawing board. 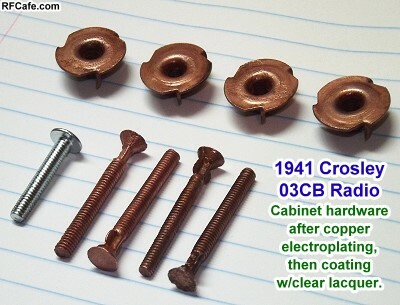 After doing a little more research I found that high iron content steel, which this hardware likely was, did not accept copper plating well without first plating with something like nickel. It has to to do with the metal's location on the galvanic chart relative to copper. 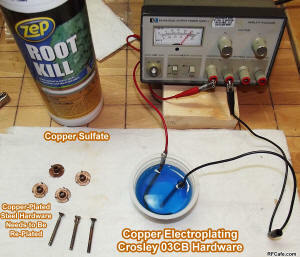 Not to be deterred, I decided to try the copper sulfate method. Where to find copper sulfate? It is readily available online from laboratory supply companies, but the shipping cost would double the total cash outlay. A Google search revealed that the stuff you dump down your drain or toilet to clear roots out of underground drain field pipes is loaded with copper sulfate pentahydrate - close enough. Home Depot sells a 16-ounce bottle for $12. Bingo. I dissolved as much of it as I could get to dissolve in a plastic cup (see photo above left) filled with warm water. It turned a nice blue color. 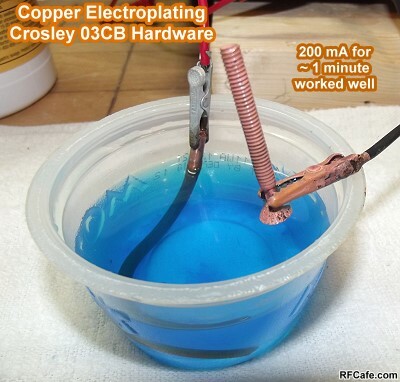 Another thing I learned on the Internet is that using copper sulfate was tricky because it would tend to plate the metal without any voltage applied - immersion plating. I tried that first just for kicks and after about only 10 seconds it produced a really nice copper layer on the stud, but it also wiped right off. What you need to do is connect the cathode to the part before placing it in the solution - hot dipping. With a voltage that I knew would produce about 100 mA of current (voltage required varies with distance from the anode), I dipped the stud into the solution. I alternately inserted and removed it every 10 seconds or so until the plating looked 'about right' in scientific terms. I held my breath and wiped the 10-32 stud with a cloth. Voila! The plating remained! I dipped it a few more times for good measure and then did the other three. The four 'T' nuts (aka blind nuts) received the same treatment. It adhered so well that I could use a brass wire brush to shine up the dull surface finish without burning through anywhere. All eight pieces were dried, wiped with acetone, and sprayed with a coat of clear acrylic lacquer to preserve the nice, shiny appearance (see photo to the left). There are a couple other plated brass parts on the electronics chassis that will eventually get the same treatment. There are shock absorber springs at each corner of the metal chassis as well as the bolts that pass through the springs and into the copper 'T' nuts that will need electroplating. Who knows what else I'll decide to electroplate along the way?